I think it’s unfair when you see dramatic weight loss and success stories on television or infomercials and not know the WHOLE story behind the transformation. You go out and join a gym, or buy a DVD or some gadget, very excited to get started and start seeing some results. And then after a few days’s or weeks you’re not seeing anything happening, and you quit. And then blame yourself for not being able drop weight every week. The thing is there’s way more to those dramatic transformations than meets the eye. A couple of years ago I was contacted by a major network looking for a couple of local personal trainers for a year long major transformation and weight loss program. 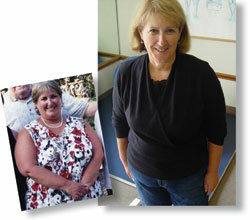 We’re talking 100lb and 200lb weight loss goals, carried out over 12months. I supplied the trainers who then literally lived with their clients 10-12 hours a day for the next year. So you know those contestants lost weight! One lost over 200lbs that year! When you saw the program you never saw this. What you saw was the host/celebrity trainer dropping in from time to time to help his clients stay on track, while they “guided themselves” through his program apparently on their own. What you didn’t see were the four real drivers of their success. The Accountabily of the trainer right in their home. Day in and day out. Holding them accountable for their behaviors and keeping them on track. The Social Support that the contestants gave each other(even though they were competing) Talking on the phone and giving support to one another many times throughout the day. The Deadline of knowing they only had one year to complete this program. And the Incentives of cars and cash for losing the most weight at different points through the year. And they did have the added social pressure of their results being revealed to a national television audience. This isn’t meant to take anything away from the accomplishments of the contestants. Because if you have some goals. Especially some BIG goals for yourself, you’re going to need more than a gym membership and good intentions. You MUST have all four of these pillars in place in order to succeed with your transformation. The truth is that you absolutely, positively, must have accountability, social support, a deadline, and an incentive working for you. Take even just one pillar away and your chances of success plummet. The four pillars allow you a strong and sturdy foundation of success, one that will allow you to make such dramatic changes in such a short time that they will appear almost unbelievable. Trust me, I’ve witnessed it happen time and time again in my Rapid Fat Loss contests and when coaching VIP’s and Boot Camps. And especially the Body Balance Challenge. Let’s review the four pillars of Transformational Success that you must give and receive to make this your Best Year Ever. The first pillar is Accountability. Research shows that daily accountability – even when delivered online – is associated with better results in a Transformation. The second pillar is Social Support. Trust me, every transformation has its good days and bad days, and when you are going through the dips, you need people to be there with support and encouragement to keep you going. In the past you might have tried to transform on your own and found it too much to bear. In the Body Balance Challenge you know there’s others, just like you, by your side. With support and daily inspiration, you’ll finally have the positive people in your life that you need to dramatically transform. The third pillar is a Deadline. From the day people begin on the Body Balance Challenge, they know they have only 6 Weeks or 42 days to change. Whatever you are going for, the deadline will work like magic to keep you making progress and pushing forward every day. With it, you’ll make changes every day. Without it, a transformation goal often remains just a dream. It’s often said the deadline is the biggest secret of success – and with the Body Balance you have it on your side. Finally, the fourth pillar is an Incentive. In addition to the personal incentives you have in place to support your transformation, the Body Balance Transformation Contest is giving $300 to the winner. Not only do you have an incentive to reach your final goals, but you also have powerful incentive just to take action. It’s only by taking action and using the four pillars of success that you’ll achieve your dreams. In short, you finally – thanks to the Four Pillars – now have everything working in your favor to practically guarantee your success. The foundation for your Transformation has been set. The four pillars of success have not only been given to you, but they’ve been DONE-for-YOU in the Body Balance Transformation Challenge. You finally have everything you need to make this your best year ever. I’m looking forward to your success. P.s.This is the last week to enter the Body Balance Challenge. Don’t go it alone, get the 4 pillars of success under you and go for it!